First off, what does SMART stand for? Specific Measurable Attainable Relevant and Time-bound. This year it’s all about Reading Comprehension and Reading Level. Osborne School’s SMART Goal 2018-19 is: By June 2019 100% of Osborne Students will be achieving *mastery or proficiency standards or *50% catch up growth or *an individual goal in text level and reading comprehensive. Ways To Help Your Child Achieve Success in Reading! The best way to get better at reading is to practice! Finding reading material at home may be difficult, visit a library, try a newspaper, a magazine, online reading, a recipe, or even a note sent home. Check out the picture below. 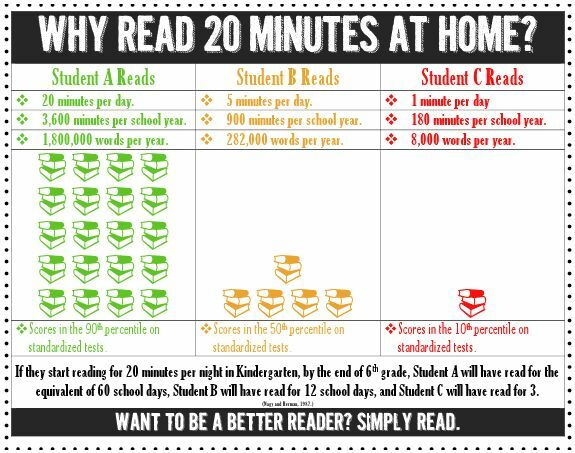 Reading at home for only 20 minutes a night can help your child achieve success in reading!